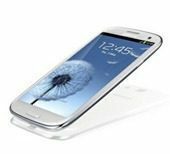 The Samsung Galaxy S3 is set for a huge launch in the US within weeks. The much anticipated smart phone will debut on five US carriers starting this month, according to Samsung. The S3 will be available on Sprint, T-Mobile, AT&T, Verizon, and US cellular. Samsung left open the possibility that the phone will be priced differently on different carriers. While they didn’t give us a breakdown, they said the phone would start at $199. Samsung did not provide us with an exact date for the launch either. They said the carriers would announce when the phone will be available on their networks themselves. Verizon was the first to jump into the arena – they said they would begin taking preorders almost right away, but they did not provide a launch date. The Galaxy S3 will no doubt be a major player in the smartphone market this year. It will be a major competitor to Apple’s iPhone 5, which is yet to be released. Samsung launched the Galaxy S3 in Europe a week ago today. They immediately ran into the wall of inventory issues, with some shoppers who had pre-ordered the phone being told that their phones may be delivered weeks late.